Mass is the central act of worship in the life of a Catholic. Going to Mass is about spending time with God, but also receiving his graces (inner strength to live the Christian life). The name ‘Mass’ comes from the final blessing said by the priest in Latin ‘Ite missa est’ meaning “to send out” as Jesus Christ sent his disciples out to the world to take his teaching to them. 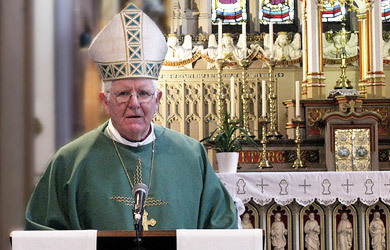 The Mass has four basic parts or ‘rites’. The beginning is called the ‘Introductory Rite’. At the beginning, the priest processes in, accompanied by altar servers, (usually boys and girls who help the priest by carrying things, giving him things). Often the congregation (all those who are there) sing a hymn. 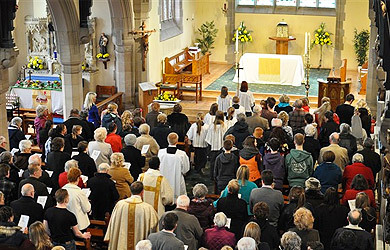 Once the priest reaches the sanctuary (the part of the Church where the altar table is) he begins Mass by saying the sign of the cross; ‘In the name of the Father, and of the Son and of the Holy Spirit, Amen.’ This short prayer means that everyone is reminded that they are baptised into the One God in three persons, and so puts themselves into his protection. Then the congregation are given a few moments to reflect upon the things they have done or not done which hurt other people, and are invited to repent, or say sorry to God. This is because not being sorry for sins (when we have hurt other people or disobeyed God,) can be a barrier to being given the graces God wants to give us. 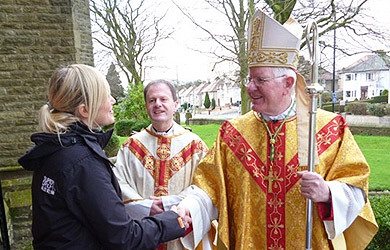 The second part of Mass is called the ‘Liturgy of the Word.’ Liturgy is an ancient word, which came from the ancient Greeks meaning ‘official work,’ so Mass is part of the official prayer of the Church. In the liturgy of the Word, everyone listens to readings from the Bible; first, a story from the Old Testament which is completed by what Jesus Christ did, e.g. the story of the Israelites being fed on manna in the desert (Exodus chapter 16), is completed when Jesus Christ said ‘I am the bread of life’ (John chapter 6). Then a psalm is prayed or sung on the same theme. The second reading is usually a letter from St Paul and then everyone stands to listen to a reading from the Gospel, the story of Jesus. This reading will show how the Old Testament is completed by Jesus. After the readings everyone sits and listens to the homily, or sermon preached by the priest. To complete this part of the Mass, on Sundays, everyone recites the Creed, which is the statement of faith in God, and then each parish has its own set of ‘intercessions’ that is, a set of prayers for local issues and people. 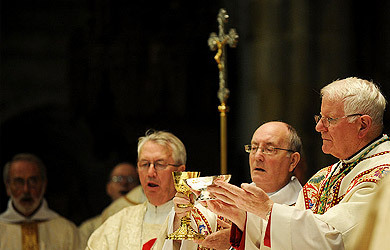 The third part of the Mass is called the liturgy of the Eucharist. ‘Eucharist’ means to give thanks, so it begins by the ‘offertory’ when we offer ourselves to God. This is symbolised by taking up the bread and wine which will become the Body and Blood of Jesus Christ, and the collection. During the Eucharistic prayer everyone kneels as to worship Jesus Christ who becomes present under the appearance of bread and wine when the priest says the ‘consecration’. The change is not ‘done’ by the priest, but by Christ, and whilst visible, nothing appears to have changed, the change is one of substance, of what it is. 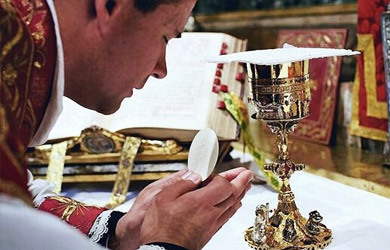 Those who are able to receive ‘Holy Communion’ then process up to receive, either in one kind (just the host, the Body) or in two kinds (from the cup as well). 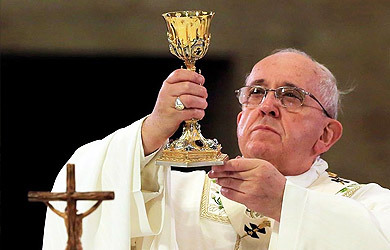 Those unable to receive Holy Communion, either because they are not Catholics, or because as Catholics they have disobeyed a serious law of the Church and have not been reconciled to the Church, are invited to come forward and receive a blessing, which can be called a spiritual communion. Much has been written on the central mystery of the Eucharist and St. Cyril of Jerusalem writing in the late fourth century said, ‘Do not look upon the bread and wine as something ordinary, for, by the Lord’s own words, they are his Body and Blood. Even though perception suggests this to you, let faith grant you certainty. Do not judge the matter by taste! Be firmly convinced by faith that you have become worthy of the Body and Blood of Christ’ (Mystagogical Catecheses 4, 6).